Rua Khun Mae by Siam River Cruise, A family owned and operated river cruise business for over 25 years. We offer scenic cruises along the historic Chaopraya River on traditional teak rice barges. Departure by motor boat from River City and cruising along Chao Praya River and canals transfer to our Barge at Bangkoknoi Canal around 3.30p.m. On the Rice Barge welcome you on board with delicious ?Mai ?Tai? ( Thai cocktail) , we serve you cold towel, soft drink ,many kind of fresh fruist and thai desert for drink it unlimited serving. 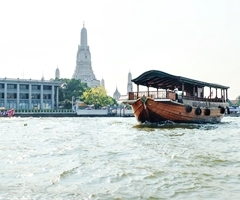 While we are cruising along Chao Phaya River we will pass many interesting places like Chineses Shrines, Muslim Mosques, Catholic Church and many temples. Our highlight will be Temple of the Dawn, Royal Grand Palce, Siriraj Hospital where our king has been admitted there. Along Bangkoknoi canal ypu will be impressed the real Thai life style along the canal. Rics and poor stay togetter, big and small wooden houses and we will pass Royal Barge Musiem. You will enjoy is trip and it will be unforgettable experience for your stay in Thailand.